Drivers navigate through ever increasing traffic, sometimes supported by assistive tools and often while interacting with devices and being sociable. This makes it a challenge to predict driving behavior and the effect of driver support systems on driver performance. Until now it was hard to find an easy-to-use, integrated system for studying driving behavior. i3B introduces an innovative new research tool. It combines the strengths of each partner to deliver a powerful and easy-to-use test instrument for understanding driver behavior and evaluating human-machine interface designs. DriveLab has been designed in cooperation with Delft University and the HAN University of Applied Sciences. This new tool helps researchers understand driver behavior and the influence of support systems on behavior and performance. It furthermore helps vehicle and electronics developers in testing how their products are being used and what the effect of these products will be on driving behavior, providing them with valuable information for further improving their designs. Easy to use: a complete solution, integrating all relevant data into one package. 3D remote eye tracking offering accurate measurement of the driver’s gaze behavior. Integrated system: no need to become a specialist on individual system parts. Static & dynamic object detection. Green Dino’s driving simulator is a realistic virtual environment proven to evoke real-world driving behavior. The virtual environment uses artificial intelligence to create a realistic, interactive driving experience which increases the effectiveness of behavior evaluation. It allows for controllable and reproducible driving scenarios. Multiple driving tasks are integrated for automated assessment of learning curves, driving styles and road safety. Driving tasks are predefined, but the scenarios can easily be adapted to suit your specific application, even if you’re not a trained programmer. A large set of predefined scenarios is standard included. A three-camera remote eye tracking system, made by Smart Eye, is optionally included in the setup. By using this eye tracker, you can accurately unobtrusively assess a driver’s gaze behavior, allowing you to see and analyze what a driver is looking at, in which order and how long. Whether a driver looks at objects in the car or at traffic can influence task performance: DriveLab allows you to automatically analyze what static and dynamic objects the driver looks at, independent of task or environment. Smart Eye is the preferred eye tracker for the automotive industry because of its robustness and because it is not head-mounted, performing well even if the head is facing different directions. Gaze information measured in full 3D is automatically imported into The Observer XT, saving you a lot of time transferring data. Furthermore, the eye tracker automatically collects data on head-movement, eyelid position and pupil dilation. 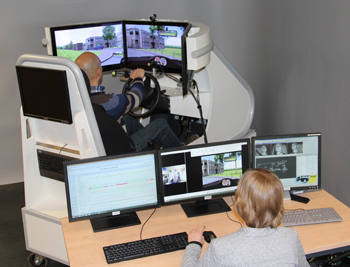 Multiple video streams are generated in the simulator setup, including the virtual environment and a video of the driver. Noldus Information Technology’s digital video recording tool Media Recorder automatically makes synchronous recordings of all video streams. Workload is a key parameter to understanding why drivers do what they do. The integrated driving research environment enables development of methods for assessing driver workload based on parameters such as pupil diameter, blink rates, scan patterns, speed variation, and so on. Other measurements such as physiological sensors (ECG, GSR, etc.) and video-based facial expression analysis (FaceReader) can be added to the setup, which can also be used to assess performance, workload and emotion of the driver. Since DriveLab is an open platform, it is also possible to add your own algorithms and sensors. The Observer XT is Noldus Information Technology’s flagship tool for the analysis of human behavior. Its synchronization and integration capabilities make it very easy to accurately link gaze behavior, vehicle control parameters, workload and expert evaluations, supported with video feeds. Besides an integrated visualization of all data streams, The Observer XT allows you to execute a combined analysis on all data streams. You can for example compare performance of the driver when looking at the dashboard to the moments when the driver was looking at traffic. Although all relevant data are combined into one system, the original data are also still available for the researcher. Together these components offer an integrated driving environment for research on behavior, driving performance and workload. Instead of manual combination and synchronization of data streams, this setup allows you to do your complete studies accurately and efficiently. i3B can assist you in installation, training and setting up experiments, including the creation of custom scenarios. If you already have your own eye tracker or simulator, we can support you turning this into your own custom integrated system for analysis of driver behavior.